Hello, my name is Jay & I specialize in product strategy, design direction, wireframes, prototyping, branding, visual design, & illustration.  Thirsty Interactive is my personal portfolio of work & represents a small collection of projects I've been involved in. I've had the opportunity to be in a variety of design roles - from working in-house at some of the largest & best known media giants, to consulting for agencies, start ups & corporate environments, & all kinds of freelance design projects inbetween. Projects have ranged from apps, large media websites, promotional microsites, ux/ui, online campaigns, branding, prototyping, iconography, & illustrations. I am a designer because I love a good story that connects people & I enjoy building things. I want to work with the most talented (& kindest) people I can to create useful, innovative, & meaningful work together. Feel free to reach out if you have any questions on the work I've done or if you have a project I can help you with. The goal of this complete redesign was to give Soccer.com's users more of what they wanted and to maximize engagement by bringing content and commerce together as seamlessly as possible - with a strong emphasis on improving the experience for mobile commerce. What made this project so memorable and successful was being able to rub elbows and chat collaboratively with an awesome client that truly cares about user needs and how they can tie back into business goals. The mobile app was paired with and powered by a scoreboard tablet app that was built into a custom table to keep score and aid in player sign in. I was at Gannett / USAtoday.com serving as the Senior Art Director over their digital experiences. It was truly Awesome working with such an amazing internal crew of designers & developers. I worked on & was involved with about every aspect of the last relaunch, AND it was definitely a team effort. 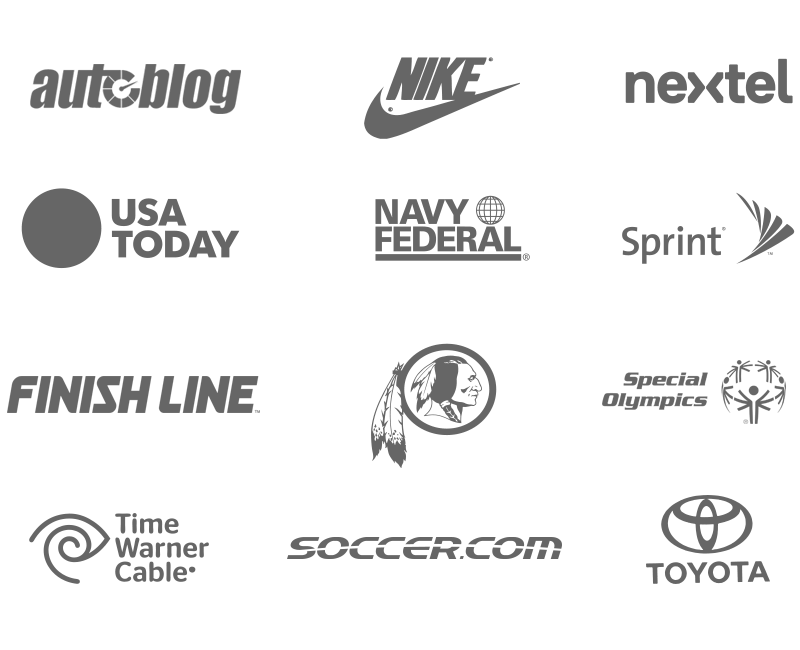 The initial push for the foundational design direction were created by the exceptionally talented folks at f-i.com. Projects shown here are the ones I was involved with during & beyond the relaunch effort in either a design direction overview or doing the design myself. 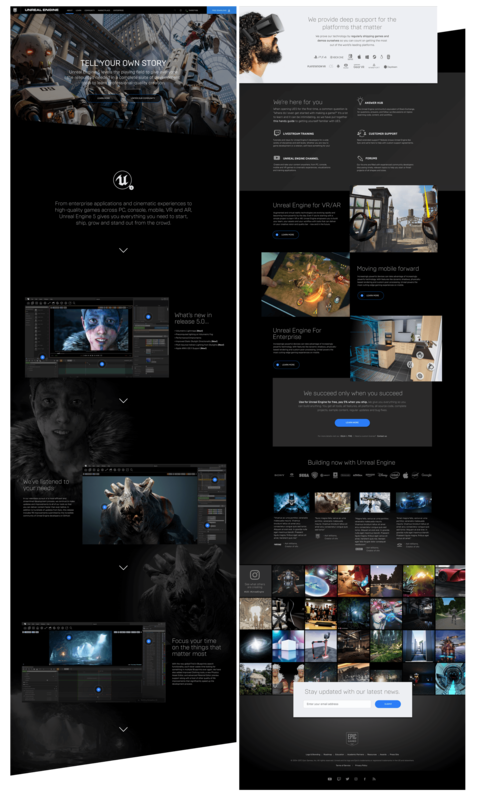 I created a more product focused approach for the Epic Games Unreal Engine website that improves the marketing messaging and creates a better understanding of what the Unreal Engine platform is, its capabilities, and its value. It was meant to build upon its existing brand identity, but also evolve the design to pull in a more modern look & feel. The final delivery was a fully functional prototype with elegant animations and tasteful parallax transitions that help tell its story. Autoblog obsessively covers the auto industry with news, reviews, podcasts, amazingly beautiful photography & spirited commentary on automobiles & the automotive industry. 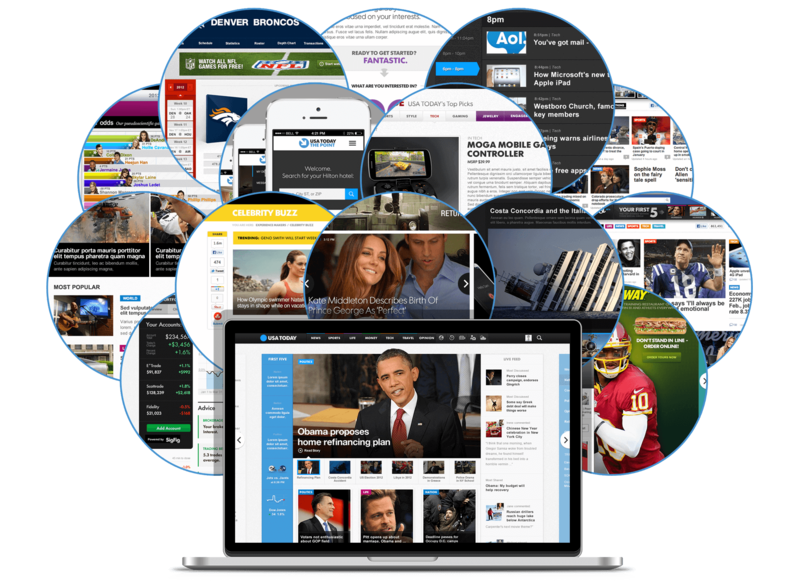 Autoblog has grown to become one of the largest enthusiast websites for automotive coverage in the world, with nearly half a billion page views each year. For this complete redesign / CMS overhaul, we created & presented multiple prototypes to user groups & we listened closely to our user feedback & suggestions, refined & enhanced the prototypes and then conducted even more usability tests to help hone in on what our users wanted. 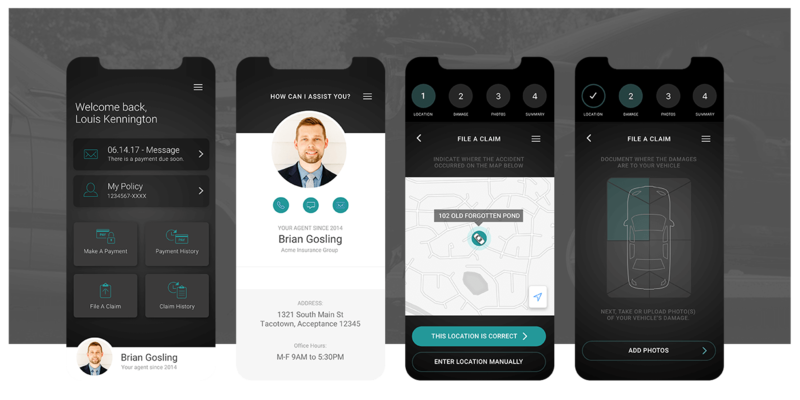 To accompany the site launch we created an app so users could not only enjoy great automotive coverage & news on the go, but also integrated localized auto shopping that helps the user research, configure, and compare. All in all, this was a very fun and unique project to be a part of - a great team of crazy talented front end & back end developers, passionate editors who know their users well, & product & business folks who care about the user experience & want to make the site as good as possible. 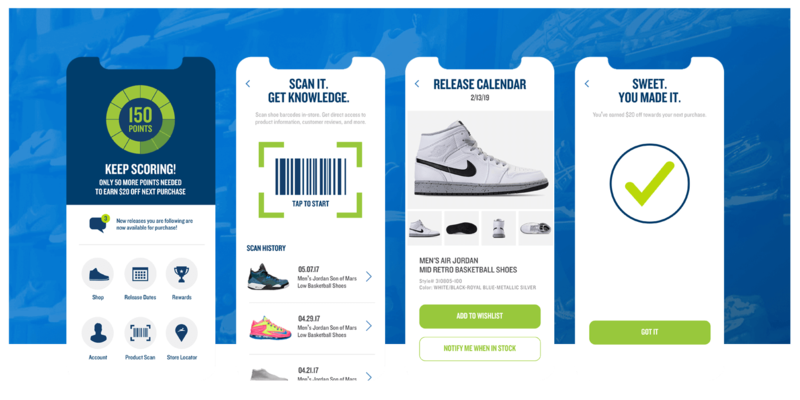 Working closely with Finish Line's internal design team, we created a loyalty and rewards app to get up to date info on points earned, direct access to rewards, and notifications for special offers. It’s not a secret that most internal time tracking tools and processes are less than ideal. We wanted to change that, starting with our own. 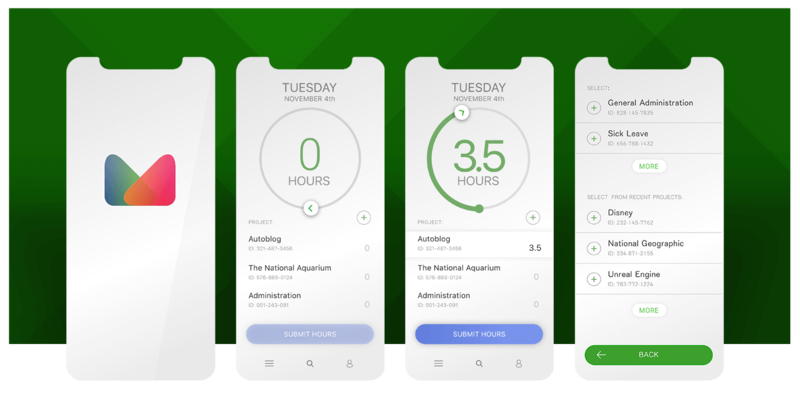 We wanted to create a mobile focused POC time tracking tool that employees can use to easily log their daily hours, and the ability to get notification reminders on their phone for the times when they forgot. 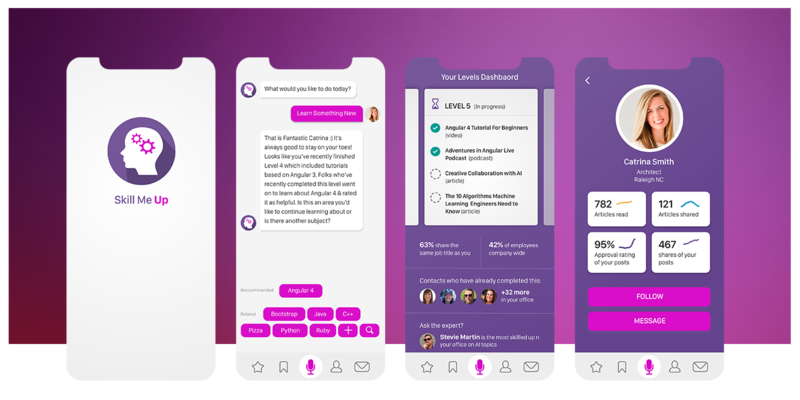 With the intention to support technical conversations in pre-sales, this Proof of Concept was created to help showcase the features and capabilities that hybrid apps can have. From a functional perspective, it disproves many common misconceptions of the limitations of creating a hybrid app. From a user perspective, it explores common pain points in the filing claims process & suggests ways to improve them - and of course - with the requirement to do thorough usabilty testing & research once the opportunity arose. While it was not a "real" project, it did create an opening to explore and skill up within the internal tech team and have some fun, & prepped the sales team with a conversation starter with potential clients. 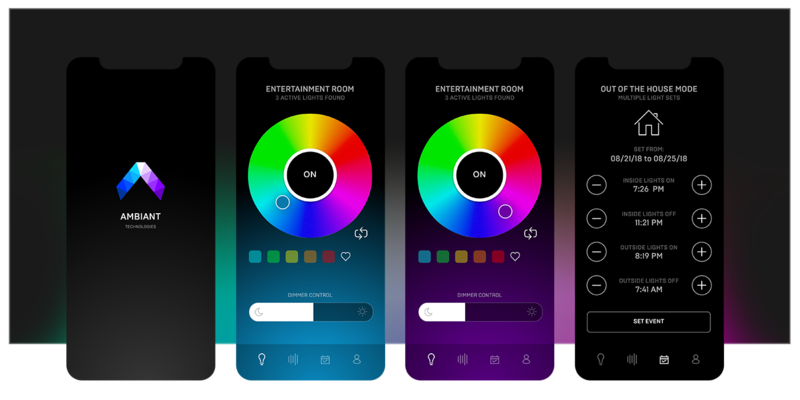 This convenient & easy to use smart light app gives you the control of the lights in your home with a touch of a button. Easily set your lights to be are on or off, adjust light dimming, the light colors, create timers ( alarms in the morning or lights out in the evening), events ( if you leave on vacation ), create loops to set the mood for occasions, and be can set to adjust to sounds such as music or television - per device, or by creating a saved set of location specfic combinations. 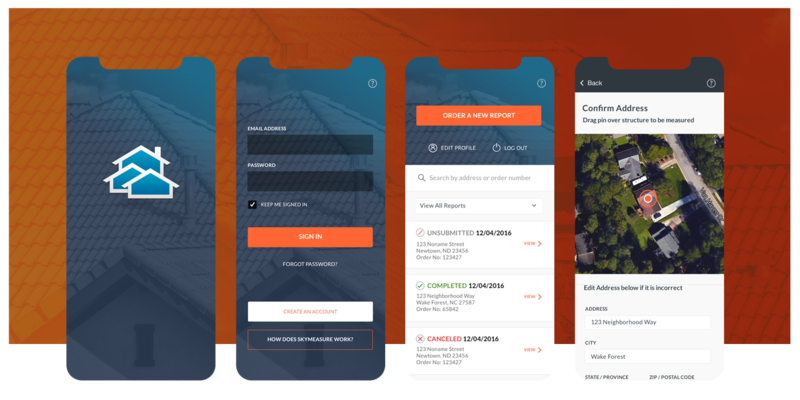 Using aerial photography from satellites, the SkyMeasure app is a property measurement tool that provides an accurate and affordable service for roofing experts. The app makes ordering aerial roof measurement reports simple and fast. You can order a report quickly, view recent and completed orders, and get report status updates. Find food trucks nearby with this simple and handy app. 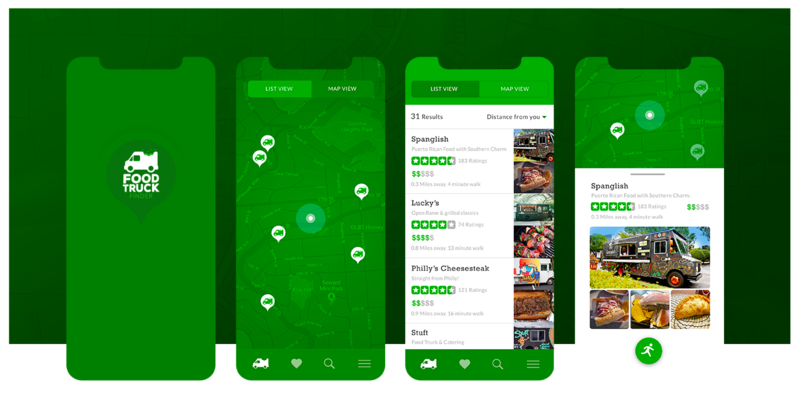 Locate food trucks in relation to where you are at with directions, see and review their ratings, check out what's on the menu, sort by food type, add food trucks to your list of "favorites", and see a photo of the food truck for easy finding. What started as a simple app created for a new development intern turned into a full app available in the app store. Exploring new opportunities on how Artifical Intelligence can add value to experiences like never before, the chat bot in this app knows your job role and geographic location, your previous history of topics you have trained on, can see trends in how different types of content relate to eachother, analyzes trending data of content that has been found valuable by either other employees in your area or in related roles, and makes suggestions for different types of training, courses, and content specifically for you. 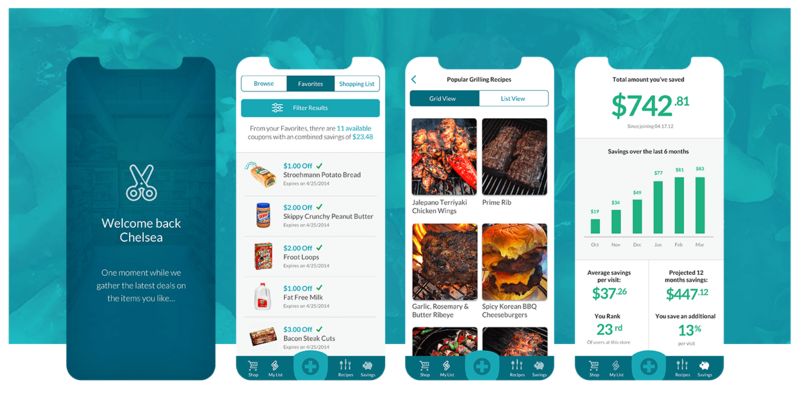 A white-label loyalty rewards app created to help retailers more effectively engage their customers by being able to track and target each individual user's buying patterns, surfacing recipes they might like based off the foods they purchase, present relevant promotions based off thier previous purchase history, & share incencetives in areas where the app can save users money. 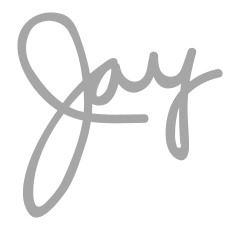 The more recent logos I've worked on have been app focused - so there is a strong need to create a unique logo mark that shows up well in app icon size. "Jay is a savvy, skilled and collaborative digital professional that is an absolute delight to be around. His combination of creative talent, ux sensibility, and genuine passion about his work make him an ideal team member and someone I am always excited to work with. Not only is Jay a great team player, but I consider him a role model. He is a true master of his craft, and he maintains a humble and approachable demeanor that makes him so enjoyable to work with." "From insightful product analysis to beautiful (and functional) product design to whimsical, fun flourishes, Jay delivered every time. Great guy to work with, his work speaks for itself." "Jay’s expertise & positive attitude is respected at all levels. Every day he approaches each project great or small, with the same dedication to excellence. Designing a site is one thing, how to market it is another. Jay knows how to captivate an audience, draw them in and keep them coming back." "…Jay often understood more than just the design that was needed, he understood the motivations and connections that needed to made with the customer, and that is exactly what he delivered. Whether it was an internal senior management presentation, a potential client's sales materials, or an entire new site design, Jay delivered!" 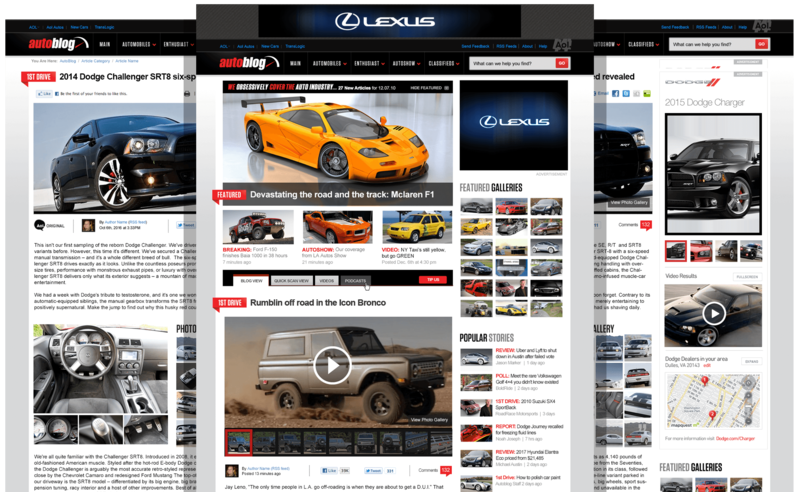 "Jay single-handedly dreamed up the entire design aesthetic for the latest redesign of Autoblog.com, a website that services over 6 million auto enthusiasts per month. 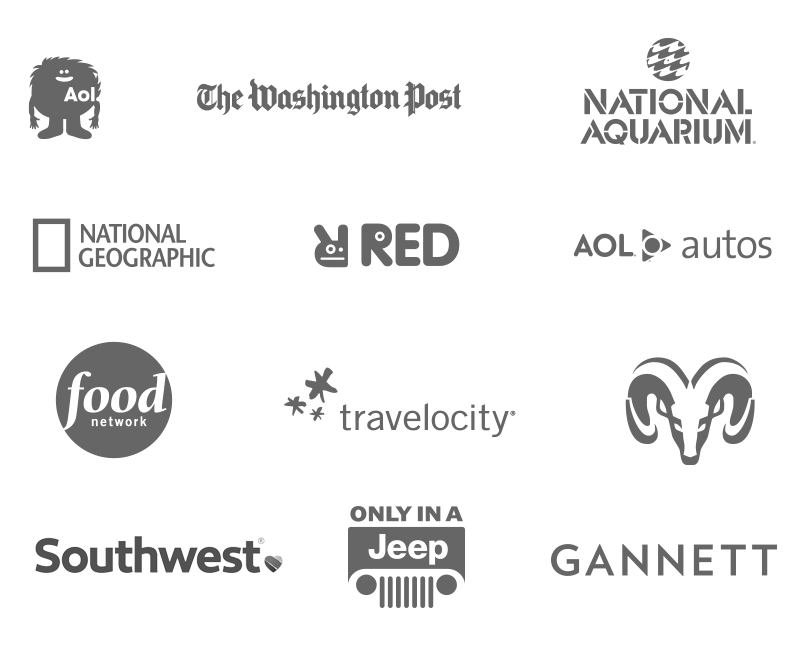 I worked with Jay on this project, during which time I witnessed not only his exceptional design skills, but also his ability to manage how web design fits into a broader architecture of editorial, sales and SEO optimization." "Jay is one of the most talented designers I've had the pleasure of working with. His focus on user experience and the intricate details that create amazing and memorable designs sets him apart from others. His passion brings new levels of innovation to each project." Even after 10+ years in the creative field, I sincerely feel very fortunate to do something for a living that I am passionate about & that I truly enjoy. Each new project brings a challenge that I am always ready to tackle to see how it evolves into the finished piece. When I am not on the computer or scribbling in my sketchpad, I enjoy hanging out with my wife, being a proud papa, playing with my dog, photography, all things design or art related, riding & wrenching on my harley, & grilling up tasty meals. In 2014 I made the move out of Washington DC & now happily call Wake Forest North Carolina home. In my role as Creative Director at PointSource, my focus has been on building the Design Experience Team & providing guidance & oversight on all projects. 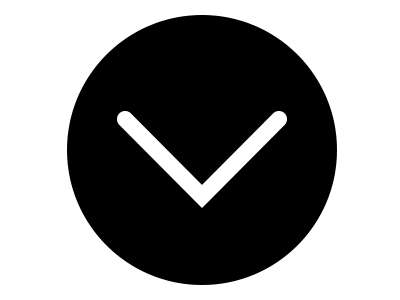 In 2014 I moved from Washington DC to Raleigh NC to help the company transform from a development led environment of approximately 20 to a full service digital agency. In the last five years, the company has grown to have over 100 employees & has been successfully acquired by Globant, a globally recognized leader in digital transformation. I still roll up my sleeves as the active design lead within projects & continue to push myself creatively to grow & evolve with our industry. I enjoy making things that solve real problems, & I want to be surrounded by others who feel the same way so we can learn, grow, & make amazing things together. I'm always interested in hearing about challenging opportunities or if you have any comments on my work. I very selectively take on consulting projects.The best way to reach me is via email. If you're a local creative and want to meet up to chat design, holler!